Re: What's new in Greenland? [nullschool] then come saturday/sunday we should see a lot of activity in most of those glaciers served by a channel out into deeper Baffin waters. So could be an interestiing week in west Greenland we'll see. Good to get ahead of the curve. A validated prediction carries a lot more weight than a retro-fit. I am skeptical of this whole paper, "Melting at the base of the Greenland ice sheet explained by Iceland hotspot history". Open peer review would have been much preferable. The actual core data is very sparse and ill-situated. The whole concept of an Iceland hot spot track has been very controversial -- the coincidence of sitting right on a rift and lack of island chain are too much for some to bear. What here is explained vs conveniently fitted to long known observations and modelling (eg 2001 Fahnestock)? I don't see where the most striking feature of NEGIS ice stream -- the sharp and narrow boundaries are predicted. Note Jakobshavn's basin is shown as very cold yet it is an order of magnitude faster than than the others. The hottest area in east central Greenland hardly moves at all. The radar-based basal melt areas shown are problematic and unsubstantiated. How determinative is geothermal, even assuming the modest excursions over the mean are as shown? It will be interesting to see what emerges from the current drill to bedrock project at the NEGIS ice stream. Abstract: "Ice-penetrating radar and ice core drilling have shown that large parts of the north-central Greenland ice sheet are melting from below. It has been argued that basal ice melt is due to the anomalously high geothermal flux that has also influenced the development of the longest ice stream in Greenland. Here we estimate the geothermal flux beneath the Greenland ice sheet and identify a 1,200-km-long and 400-km-wide geothermal anomaly beneath the thick ice cover. We suggest that this anomaly explains the observed melting of the ice sheet’s base, which drives the vigorous subglacial hydrology and controls the position of the head of the enigmatic 750-km-long northeastern Greenland ice stream. Our combined analysis of independent seismic, gravity and tectonic data implies that the geothermal anomaly, which crosses Greenland from west to east, was formed by Greenland’s passage over the Iceland mantle plume between roughly 80 and 35 million years ago. We conclude that the complexity of the present-day subglacial hydrology and dynamic features of the north-central Greenland ice sheet originated in tectonic events that pre-date the onset of glaciation in Greenland by many tens of millions of years." Not strictly new in Greenland, but as a result of Greenland melt, the earths polar wobble as changed according to NASA. Global warming is changing the way the Earth wobbles on its polar axis, a new Nasa study has found. Melting ice sheets, especially in Greenland, are changing the distribution of weight on Earth. And that has caused both the North Pole and the wobble, which is called polar motion, to change course, according to a study published on Friday in the journal Science Advances. Earth’s spin axis has been wandering along the Greenwich meridian since about 2000, representing a 75° eastward shift from its long-term drift direction. The past 115 years have seen unequivocal evidence for a quasi-decadal periodicity, and these motions persist throughout the recent record of pole position, in spite of the new drift direction. We analyze space geodetic and satellite gravimetric data for the period 2003–2015 to show that all of the main features of polar motion are explained by global-scale continent-ocean mass transport. The changes in terrestrial water storage (TWS) and global cryosphere together explain nearly the entire amplitude (83 ± 23%) and mean directional shift (within 5.9° ± 7.6°) of the observed motion. We also find that the TWS variability fully explains the decadal-like changes in polar motion observed during the study period, thus offering a clue to resolving the long-standing quest for determining the origins of decadal oscillations. This newly discovered link between polar motion and global-scale TWS variability has broad implications for the study of past and future climate. maps from climatereanalyzer.org, showing temp anomalies for Greenland through Wednesday 13 April ranging 15C-20C above normal, with large areas of the ice sheet exposed to air temps above 0C. The in-house search tool is poorly done but a key word search at google with url restricted to 'meetingorganizer.copernicus.org/' is effective. No posters are available even for the poster session but sometimes it pays to re-google the title. I came across a couple dozen items of interest ... just the titles are given below. That's amazing, there is rain all other Greenland in the days to come ! I'm confused. I only see green and orange and (Edit: hardly any) blue which seems to indicate snow not rain if I am reading legend correctly. Ouppss big sorry !!! my mistake !!! Shame on me I remove that ! A new portal for ice velocity for some glaciers in "real time" in Greenland and Antarctica. Professor Hanna said: "Our research has found an increase in the incidence of high pressure weather systems remaining stationary over Greenland since the 1980s, which is having a significant impact on extreme weather and climate change in the region. These weather systems are occurring in the area more often because of strong Arctic warming and changes in the atmospheric jet stream in recent years. "This is resulting in an increase in the occurrence of warm air in the region and it is also affecting weather systems downstream of Greenland, such as over the UK. The unusually wet weather seen in the UK in the summers of 2007 and 2012, for instance, is linked to these stationary high pressure systems over Greenland." The research team, which also includes a climate scientist John Cappelen from the Danish Meteorological Institute in Copenhagen, Denmark, found that Greenland 'blocking' pressure systems have become much more variable from year to year in December in recent decades. This reflects an increasing destabilisation of atmospheric weather systems in late autumn and early winter, which the team believe may be related, at least in part, to dramatic declines in sea-ice coverage in the Arctic region. "Sea-ice coverage throughout the Arctic has significantly reduced in recent years, which we already know is having an amplifying effect on warming in the region. What this study now tells us is that changes in stationary high pressure over Greenland are adding to the change in polar climate," Professor Hanna added. 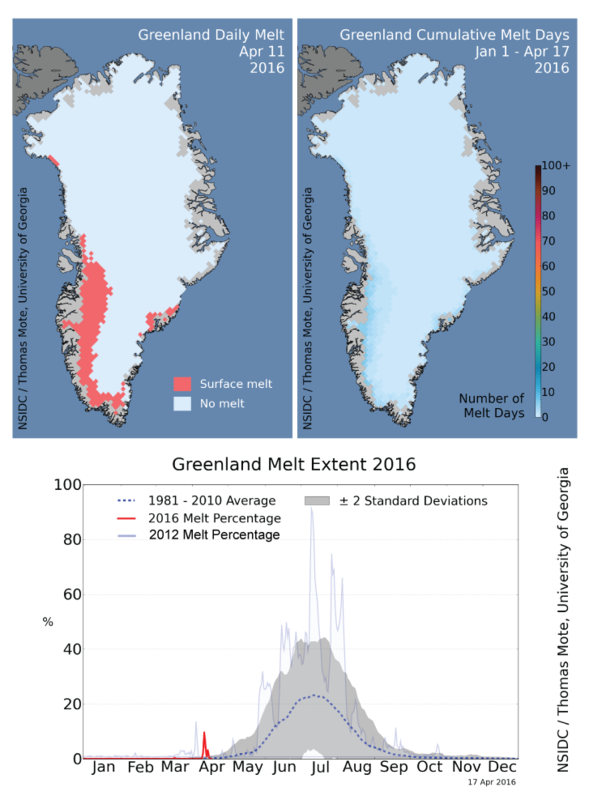 "An early melt event occurred on April 10 through April 15, encompassing the central western and southeastern Greenland coastal areas. The event was a result of a large pulse of mid-Atlantic air moving northward, bringing record warm air to the entire ice sheet and rain along the western coast. Approximately 10 percent of the ice sheet surface melted on April 11, dropping to 5 percent on April 12 and less on later days. A melt event of similar magnitude occurred on April 6 to 9 of 2012, which became the current record surface melt and melt-runoff season for the satellite era (since 1978). (These values and dates are slightly different from those reported in other news releases, because they are based on different snowmelt mapping methods). Early melt events are important as they lower the surface albedo by increasing the snow grain size. A lower albedo allows for more absorption of the sun’s energy, fostering more ice melt." Aurélien Mordret, T. Dylan Mikesell, Christopher Harig, Bradley P. Lipovsky and Germán A. Preto (06 May 2016), "Monitoring southwest Greenland’s ice sheet melt with ambient seismic noise", Science Advances, Vol. 2, no. 5, e1501538 DOI: 10.1126/sciadv.1501538. Abstract: "The Greenland ice sheet presently accounts for ~70% of global ice sheet mass loss. Because this mass loss is associated with sea-level rise at a rate of 0.7 mm/year, the development of improved monitoring techniques to observe ongoing changes in ice sheet mass balance is of paramount concern. Spaceborne mass balance techniques are commonly used; however, they are inadequate for many purposes because of their low spatial and/or temporal resolution. We demonstrate that small variations in seismic wave speed in Earth’s crust, as measured with the correlation of seismic noise, may be used to infer seasonal ice sheet mass balance. Seasonal loading and unloading of glacial mass induces strain in the crust, and these strains then result in seismic velocity changes due to poroelastic processes. Our method provides a new and independent way of monitoring (in near real time) ice sheet mass balance, yielding new constraints on ice sheet evolution and its contribution to global sea-level changes. An increased number of seismic stations in the vicinity of ice sheets will enhance our ability to create detailed space-time records of ice mass variations." Hurricane-force low west of Greenland. open access and very nice. I recommend fig 3) (becoz it's pretty) but the meat is in figs 4,9 and 10.
another melt spike. This year might see 2012 scale melt. 24,8°C was measured at Nuuk Airport on June 10 2016, the previous record was only 24 hours old at 24,7°C measured at the same station. To be followed by a plunge on June 16th. I wonder if this will be accompanied by clear skies and sharp S2A images. To be followed by more spiking? Not seeing any year-to-year volatility index, seems like they could just use the 'beta' volatility used in tracking stock prices. The full resolution graphic is very peculiar in that someone (not at NSIDC) screwed up the placement of tick marks, ie days and weeks are non-integral numbers of pixels (and even the months are wrongly spaced). Thus it is not feasible to subdivide to melt date. Who would make such a stupid design choice when 4 pixels per day was so close? You won't see stuff like this from the Rignot group. For the "new normal"l 2016 looks to be under performing. Dark Snow Field Log 2016 First Entry, by Peter Sinclair. Climate Reanalyzer is forecasting High Sea Level Pressure at Greenland this week. Which is the best answer to Sep-2012 ASI lost (compared to 1979-2000)? Volume is harder to measure than extent, but 3-dimensional space is real, 2D's hide ~50% thickness gone. -> IPCC/NSIDC trends [based on extent] underestimate the real speed of ASI lost. omg we have barely wrapped our heads around Sentinel 1A and now they've launched and re-maneuvered its twin Sentinel 2B to the same plane plus taken the first interferograms as of 22 June 2016. The satellites are on the opposite sides of the earth in sun-synchronous near-polar orbits at 693 km altitude with 175 orbits per 12 day repeat. The time available for glacier movement is half the orbital period (98.74 minutes) or 49.37 minutes for a single cycle. That pencils out to 3.57 m for Jakobshavn assuming peak velocity of 52 m/day, far less for Petermann. "Sentinel 1AB are an ideal tool for monitoring glacier flow and changes in Arctic and Antarctic ice shelves. Sentinel-1’s first such paired ‘interferogram’ combined a Sentinel-1A scan over southern Romania on 9 June with a Sentinel-1B acquisition over the same area just one day before reaching its target orbit position. A second interferogram over northwest Romania was produced shortly after Sentinel-1B reached its final orbit [below]. For interferometry, SENTINEL-1AB require stringent orbit control. Satellite positioning along the orbit must be accurate, with pointing and timing/synchronisation between interferometric pairs. Orbit positioning control for SENTINEL-1 is defined using an orbital Earth fixed "tube", 50 m (RMS) wide in radius, around a nominal operational path. The satellite is kept inside this "tube" for most of its operational lifetime." software and not require manual entry (or even understanding) by users. Extract: "The sextet - Pine Island and Thwaites in Antarctica; and Jakobshavn, Nioghalvfjerdsfjorden, Zacharae Isstrom and Petermann in Greenland - are major contributors to ongoing sea-level rise. They are thinning and flowing faster, and scientists believe some of them have become unstable. Routine observation should pick up any sudden changes in behaviour. The data is currently being gathered by the Sentinel-1a spacecraft, but it will be assisted soon by a sister platform, Sentinel-1b, which the European Space Agency will launch on Friday. Both have radar instruments that are able to see the glaciers' surfaces day or night, and in all weathers. They can track activity by keeping a watch on the velocities of crevasses as they move towards the ocean." "Between January 2011 and December 2014 we estimate that the Greenland Ice Sheet lost an average of 269 ± 51 Gt/yr of snow and ice. The observed deficit indicates an annual contribution of 0.74 ± 0.14 mm/yr to global mean sea level, which is approximately double the 1992–2011 mean ..."
Doubling in a decade ? Open access. Read all about it. Greenland ice sheet is estimated to contribute about 7.2 metres to global sea level when it melts away. That contribution is due to the melting of all the ice above sea level becoming water, as all below sea level dose not contribute to sea level rise if it melts, apart from a small fraction due to thermal expansion. But has anybody estimated what the effect on sea level rise will be from the resulting isostatic rebound? Assuming it all rebounds to near or above present-day sea level, that displacement would add several metres more to the current maximum estimated sea level rise. Same goes (much more, I imagine) for Antarctica too as it also has a massive ice overburden on top of land held below sea level which will no doubt rise (and hence displace ocean) when the load is removed. That's the orbital period in minutes but since the Earth is rotating under the orbit that translates to halving the 12-day repeat-period into six days. But that rebound volume has to come from somewhere. The surrounding sea floor perhaps? So the overall effect would be none. Just a guess. Like noises in a swound! Someone already pointed out that isostatic rebound in one place leads to a lowering somewhere else - the volume of the lithosphere does not change. Isostatic rebound can be quite fast, in South-East Iceland it is currently measured in centimeters annually, due to melting glaciers in that area. Apparently some areas of Greenland are rising by up to 15 mm annually (a quick Google search gave quite a lot of information). Globally, isostatic rebound does not affect sea levels. Locally, sea levels may well fall along the Greenland coast, at least in the short run, both from isostatic rebound and from gravitational effects (the mass of the ice sheet pulls the surrounding ocean towards it). Globally, isostatic rebound does not affect sea levels. Wow.. that raise a really interesting isostatic problem (Finally a post in my field). Lets assume that the mass change in a column of the ocean with added water has to be isostatically balanced by a mass change in a column of continental rock (otherwise rock will flow from the high to low pressure as evidenced by post glacial rebound). Hl = height change of continent, Ho being height change of ocean floor. However, a second assumptions is that the volume of rock does not change globally. Ho = -0.3/0.7Hl (the continents occupy 3/7 of the globe) volume change of oceanic rock matches continental rock. Of course, finding that perfect isostatic balance is going to take a lot longer than it takes the melt water to flow around the globe. Thing of it as squeezing on a spot.. you apply pressure on a broad area to have high pressure in one spot. Yes. We are living on the spot. Interesting - and makes sense. I stand corrected! However, a second assumptions is that the volume of rock does not change globally. ... volume change of oceanic rock matches continental rock. I don't really understand when you talk about the flow of "rock" - isostatic rebound is caused by magma in the mantle shifting about. "Continental rock" presumably means continental crust, and "oceanic rock" ocean crust. Neither sees any volume change due to isostatic pressure changes. The density of the mantle is thought to be 3.3 in the top layers, probably slightly higher below the continental crust than under the oceanic crust. The page that nukefix's post links to states that due to post-glacial isostatic rebound, the ocean basins are getting larger (deeper), causing a net effect on sea level of -0.3 mm annually. The Greenland glacier is much smaller than the Ice Age ice sheet, so any effects on sea level due to isostatic rebound from the melting of the former are going to be miniscule. Rock does flow: Mantle convection is not from movement of magma, you only get melt where the solidus of the rock approaches the geotherm, such as mid ocean ridges, underneath hotspots, in thinning events or where fluids are injected, such as subduction zones. There is unlikely to be any partial melt underneath Greenland. Much of Greenland is (we believe) ancient shield rock. You are right of course - the mantle is rock, not magma. And the mantle does flow - and has a density of 3.3 in the top layers. Your previous use of the word "rock" seemed to indicate the crust given the density values you gave. The crust does not "flow", i.e. there is no shifting of material from oceanic to continental crust. You calculated isostatic effects of raised sea levels based on the density of the crust which seems wrong to me. Also I'm not sure whether you are claiming that the volume of the lithosphere changes due to shifting of mass in the hydrosphere. The mantle and lithosphere are both comprised of rock. The rheology changes with composition, heat and pressure. The rheology of the rock beneath shields is actually not particularly well understood. You are right, It would have been better to use the density of rock at which compensation happens in the asthenosphere, and that would scale the height changes that I made above by about 10%. I'm using conservation of volume of rock to calculate how much the extra water in the oceans would push down of the ocean floors and thereby increase the height of the continents. Of course, that takes 1,000s or 10,000s of years to happen. One further interesting point is that the water on the Greenland ice sheet is close to the axis of rotation of the earth. Distributing that mass over the oceans will cause the earths rotation to slow by a tiny amount. This is actually quite interesting - and it makes sense that more pressure on the ocean floors would lead to isostatic adjustment of the continents. Sea level rise following the end of the last Ice Age was 120 m, if we assume that the -0.3 mm rebound currently measured worldwide can be extended linearly back 10.000 years that would result in some -30 m due to rising continents/sinking sea floor. Reconstructions of sea levels since the last Ice Age, on the other hand, show a steady (if small) increase in sea levels over the same period (see https://en.wikipedia.org/wiki/Sea_level_rise#/media/File:Post-Glacial_Sea_Level.png). So I'm a bit confused - it makes sense logically that, after an initial surge, isostatic rebound should work to decrease sea levels over the last 10.000 years according to your calculations. But that didn't seem to happen? As for the change in spin, I seem to remember seeing somewhere that this can already be measured as a result of the melt of the last 25 years of so. This graph does not reflect the reality of sea level rise around 7.000 years, that is because they soften too much the datas. What a great find! Thanks J Cartmill. Or should I write "Great find, Anders Bjørk!" MacGregor et al. 2016 doi:10.1002/2015JF003803 on the thermal state of the bed. state follows the western and northern boundaries of the NEGIS system." And quite a bit under Jacobshawn. I attach a copy of fig 11. That's a very carefully written piece that makes a good effort on sparse data. Basal sliding and deformation of subglacial till, as discussed earlier for Jakobshavn, need a thawed bottom. This is not anything brought about or exacerbated by contemporary climate change but rather an inconvenient legacy condition that, unfortunately, would synergize with global warming above to raise sea level faster than a frozen legacy condition would have. Although sidd already posted the bottom line (Fig.11), Table 1 provides a very useful compendium of known basal temperature data. There's also a curious analysis of surface texture based on the MODIS mosaic of Greenland (MOG) said to delineate the ice sheet transition between a relatively smooth surface and prominent surface undulations corresponding to relative velocities and so presumably to basal melt status. Yet though shear margins of NEGIS are well defined its route is not distinguished by surface undulations and some adjacent regions don't fit the roughness paradigm. Fig.9 shows this below. There don't seem to be an immediate prospects for resolving the status of uncertain areas, not plausibly by a massive drilling grid on the flanks because ice cores are more favorable on summit ridges even though these don't have representative bottom conditions. Coring is underway this summer about a third of the way down NEGIS (good twitter site); however no one is laying out exactly what they expect to find by way of temperature profile prediction or rates of bore hole deformation. The 'companion' article of April 2016, treated neutrally by Macdonald et al, asserts that the anomaly of NEGIS is explained by northeastern Greenland warmed from below tens of millions of years prior by anomalous mantle heat associated with the Iceland hot spot. There is no chain of islands or bathymetry otherwise indicative of a hot spot track; the North Atlantic initially began to open in Baffin Bay where older basaltic flows are still evident but the subsequent forking history and mid-Arctic Ocean stalling of the Gaekel Ridge are still in a state of scientific confusion (in my view). Ice-penetrating radar and ice core drilling have shown that large parts of the north-central Greenland ice sheet are melting from below. It has been argued that basal ice melt is due to the anomalously high geothermal flux that has also influenced the development of the longest ice stream in Greenland. Here we estimate the geothermal flux beneath the Greenland ice sheet and identify a 1,200-km-long and 400-km-wide geothermal anomaly beneath the thick ice cover. We suggest that this anomaly explains the observed melting of the ice sheet's base, which drives the vigorous subglacial hydrology and controls the position of the head of the enigmatic 750-km-long northeastern Greenland ice stream. Our combined analysis of independent seismic, gravity and tectonic data implies that the geothermal anomaly, which crosses Greenland from west to east, was formed by Greenland's passage over the Iceland mantle plume between roughly 80 and 35 million years ago. "We first inventory the nature and quantity of abandoned wastes buried at the Camp Century site (supporting information). Physical waste, such as buildings and railway, is approximately 9.2 · 103 t. Chemical waste is an estimated 2.0 · 105 L of diesel fuel and a nontrivial quantity of polychlorinated biphenyls (PCBs). Biological waste consists of at least 2.4 · 107 L of grey water, including sewage, disposed in unlined sumps. Previously acknowledged radiological waste (coolant for the portable nuclear generator) had a bulk radioactivity of 1.2 · 109 Bq at the time of its disposal (1960–1963) in an unlined sump. While nontrivial in absolute terms, this radiological waste is small compared to the >4.6 · 1012 Bq accidentally dispersed in the vicinity of Thule AB in 1968 [Christensen, 2009]." New map for bottom melt of Greenland Ice sheet. Article explains how it was derived. Evidence for oldest life found in southwest Greenland on newly exposed rock. I attached an image with the rough position using Google Earth. Biological activity is a major factor in Earth’s chemical cycles, including facilitating CO2 sequestration and providing climate feedbacks. Thus a key question in Earth’s evolution is when did life arise and impact hydrosphere–atmosphere–lithosphere chemical cycles? Until now, evidence for the oldest life on Earth focused on debated stable isotopic signatures of 3,800–3,700 million year (Myr)-old metamorphosed sedimentary rocks and minerals1, 2 from the Isua supracrustal belt (ISB), southwest Greenland3. Here we report evidence for ancient life from a newly exposed outcrop of 3,700-Myr-old metacarbonate rocks in the ISB that contain 1–4-cm-high stromatolites—macroscopically layered structures produced by microbial communities. The ISB stromatolites grew in a shallow marine environment, as indicated by seawater-like rare-earth element plus yttrium trace element signatures of the metacarbonates, and by interlayered detrital sedimentary rocks with cross-lamination and storm-wave generated breccias. The ISB stromatolites predate by 220 Myr the previous most convincing and generally accepted multidisciplinary evidence for oldest life remains in the 3,480-Myr-old Dresser Formation of the Pilbara Craton, Australia4, 5. The presence of the ISB stromatolites demonstrates the establishment of shallow marine carbonate production with biotic CO2 sequestration by 3,700 million years ago (Ma), near the start of Earth’s sedimentary record. A sophistication of life by 3,700 Ma is in accord with genetic molecular clock studies placing life’s origin in the Hadean eon (>4,000 Ma)6. The danish professor of geology Minik Rosing, who has been studying the specific area for years is very sceptical of their findings. Page created in 0.052 seconds with 28 queries.